If booty-shakin’ were a crime, Harry Wayne “KC” Casey would still be doing time. 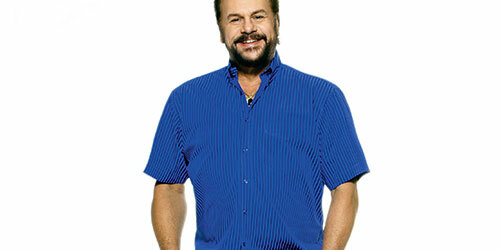 Having put Miami on the disco map in the ’70s, KC and the Sunshine Band’s No. 1 dance anthems — Get Down Tonight, That’s the Way (I Like It), Shake Your Booty — have since been de rigueur at such major events as the Super Bowl, the World Cup and every wedding or bar mitzvah you’ve ever attended. This summer the Grammy-winning musician’s Movin’ Your Body single became his fourth consecutive Top 40 hit on Billboard’s dance charts in the past year, followed up by a remix collection of the record featuring a who’s-who of deejays. “With all the tension in the world right now, I wanted to write a song to help people escape and leave their worries behind,” says Casey, 66, who this month played London and Manchester. “It feels great. I just decided to start putting out these dance remixes for the dance market only. We’ll see where it goes. I’ve been in the studio recording an album for the last three and a half years and I have enough material to fill three CDs,” he says, adding that he’s working toward an October release. Spotlighting his status as a SoFla icon, KC was this year’s honoree at the recent 20th annual Cuisine for Art fundraiser for Art and Culture Center/Hollywood. I love the climate. I love the beaches. It’s a very transient place, so it’s always changing. I don’t think there’s too much to dislike. More of a beach person. I’m happiest on the stage. in a traffic jam on I-95? I would say I’m more of a listener. I love music. Facebook: KC and The Sunshine Band. There’ve been so many. Everyone is my hero and heroine. All of my music. And the enjoyment I brought to people’s lives.